I don’t know why, but we rarely make pancakes from a mix. Maybe it’s because Anthony and I both grew up on made-from-scratch pancakes, so it’s what we’re used to. Maybe it’s because I can’t justify spending the extra money to have the dry ingredients already mixed up for me. Whatever the reason, we always turn to these two recipes when we’re hungry for pancakes. 1. I hand copied this first recipe and brought it with me when I left home and got married. 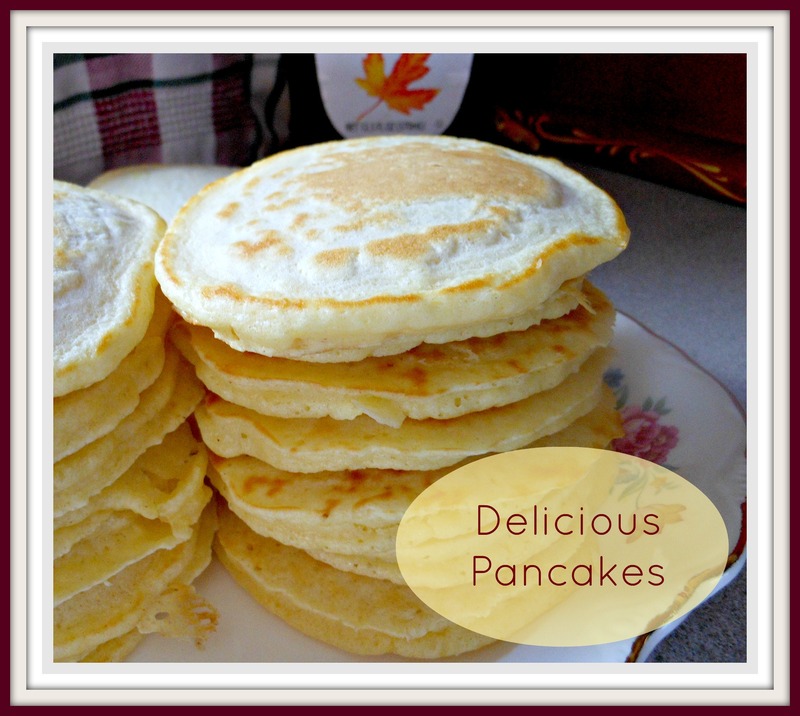 We haven’t been able to find a better recipe yet for wonderfully light and soft pancakes. The name of the recipe actually is Delicious Pancakes. Simple but true. Beat eggs slightly. Add butter and milk to eggs. Sift dry ingredients and add to egg mixture. Beat only until all flour is mixed — do not over-mix. Batter should be lumpy. Bake on hot griddle. 2. We’ve only recently discovered this second recipe. I like to use whole wheat in my baking when I can, if it doesn’t compromise the softness and flavor too much. These pancakes are made from 100% whole grain — whole wheat flour and oatmeal — and they are unbelievably soft! I believe the secret is soaking the oatmeal in milk. Soak oatmeal in milk for 5 minutes. Stir together with oatmeal mixture, mixing well. Combine dry ingredients and add to oatmeal mixture. Fry in skillet until golden brown. Made these these morning. 1T of baking soda was WAY to much 😦 Might want to fix that. I came over after you recently followed my blog. I love new followers and I love it when strangers become internet friends. I have been looking for a good wholewheat pancake recipe for forever. can’t wait to try this one. I pinned in so I can find it when I need it. I’m adding you to my blog reader. Glad we met. I do enjoy meeting other bloggers with common interests, as well. 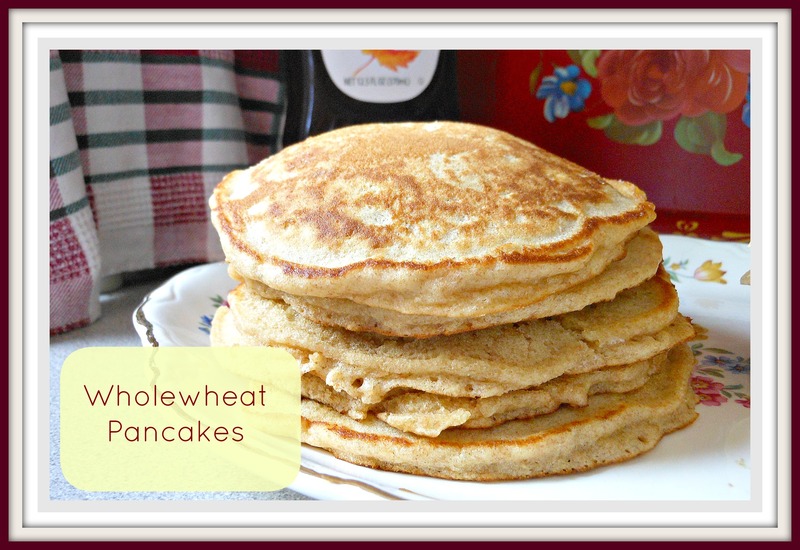 I don’t think you’ll be disappointed with the whole wheat pancake recipe. When I first found it, I was amazed at how soft a whole grain recipe could be. Enjoy! Thanks so much for this! I’m a Canadian living in England and pancake mix is just not available here. The British notion of pancakes looks more like what we call crepes. So I’m so pleased to have found your recipe! Now where do I get me some syrup? lol! You are welcome! Interesting that a mix isn’t available there. Hope you enjoy these pancakes made from scratch, then! I simply cannot eat a Bisquick pancake. Blech. My fave recipe is very similar to your whole wheat one. But, I will say that Aunt Jemima has a whole grain mix that is quite yummy. It’s a little pricey, esp since i can only find it at Red Front. BUT, my mom got us 2 boxes for Christmas along with a bottle of maple syrup—awesome gift! I have a obsession with pancakes and these look going. I making my own food from scratch too and can’t wait to try these! Hope you enjoy them. Thanks for stopping by! It would be great to make all three and see how they compare. I often substitute things in pancake recipes, and I usually add cinnamon or cardamom. Mmmm…those blueberry pancakes of yours look absolutely delicious! I’ll have to try making them. Thanks for sharing. I grew up on made-from scratch food too! We actually liked our recipe so much that when we had to go gluten-free I adapted it. These look wonderful! These look so inviting that I am thinking of going off my diet for one day just to try your recipe. Delish!! Thanks for sharing.